Various guides have been written about Deane Church. In 1952, Dawson wrote a compact and easily read version to coincide with the quincentenery of the church. A transcript (157Kb) and a scanned (23Mb) version are available for download. I am very grateful to Mr Dawson, Headmaster of our School, for accepting the invitation to write a short, popular history of Deane Church. I knew that in him we had one well fitted for the work, as he had already done the same for the famous Cheshire Church of Lower Peover. Mr.Dawson has spared no pains to make this small book as accurate and informative as possible. He, and all of us, bemoan the fact that because of the diffidence of contemporaries in recording what is obvious to them, important history, particularly relating to the early years of our Church, has failed to be passed on to later generations. All the same, we have a splendid heritage, and we ask the reader of this History to pray that we may be worthy of it, and may do our best to reveal God's light in our own time. The ancient church at Deane - in common with most old churches- was built on the best site in the neighbourhood. It stood prominently overlooking a well-wooded dene- from which Deane takes its name- with the distant view of Winter Hill across the wide valley of the Middlebrook. Tradition claims a Saxon church to have existed on the site of the present Parish Church of Deane, and this conforms to the view held generally by historians- that the majority of our ancient village churches stand on the site of an earlier Norman or Saxon church. Whilst no actual record is known to support the tradition, yet it seems reasonable to consider the evidence of the old Saxon name of the stream which runs through Deane Clough- the Kirkebrok. There is, however, documentary evidence of the existence of a church in later Norman times. We find in a deed Thomas, Chaplain of Flekho (Flixton) granting "in the third year of the seventh cycle of nine years from the translation of Saint Thomas the Martyr, the portion in the church of Eccles assigned him by Roger de Notton, to William clerk of Eccles for life." In return William grants to Thomas "all obventions of the said portion to be received in the mother-church of Eccles for four years ensuing; saving to himself the obventions of Saynte Mariden." The Roger de Notton referred to in the deed had inherited one fourth part of the parish of Eccles Church, which also included the chapel of Saynte Mariden, and he had assigned all his interest therein to one Thomas, a clerk of Eccles, who thus became the first known chaplain of Saynte Mariden, and as his salary in respect of the said chapel included "obventions," that is both "alterage" and "mortuaries" so there were then both an altar and a cemetery at the chapel from the time of its erection. In 1276 Thomas de Perpount gave to "the abbot and monks at Stanlawe and the chapel of Saynte Mariden all his land next the said chapel......" This charter is a very interesting document describing the limits of the glebe ".....from the cemetery of the said chapel on the west side directly into the Kirkebrok, following the Kirkebrok to the Mukelbrok (since called Middlebrook), following the Mukelbrok to the ditch descending to the same Mukelbrok, following the ditch into the hedge which comes across from the cemetery of the said chapel on the east side, and so following the hedge to the cemetery aforesaid. To hold and to have of me and my heirs......" One of the witnesses to this charter was a David de Hulton. The parish of Eccles was divided into four quarters- Worsley, Barton, Pendleton with Clifton, and Deane. Deane too, was divided into quarters- Westhoughton; Over Hulton, Middle Hulton, Little Hulton; Farnworth, Rumworth, Kearsley; and Heaton, Halliwell, Horwich. The whole of Deane parish covered 20,103 acres. The Cistercian Abbey at Stanlawe was built in the Wirral, at the joining of the rivers Mersey and Gowy, in 1178 and dedicated to the Blessed Virgin St.Mary, its patron saint. The abbey met with many misfortunes, including storm, tempest, fire and flood: and in 1296 the monks moved to Whalley. They took with them their records - charters, deeds and other evidences- and these were included in the Coucher Book of Whalley compiled by Abbot Lyndellay and dated 1347. This valuable record gives accurate and detailed information of ancient churches and old families over a wide area, and tells of many interesting customs and practices. 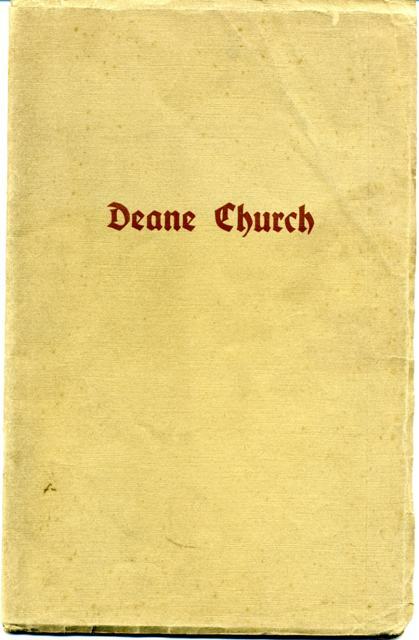 The year 1452 is given in Crockford's Clerical Directory as the date of erection of the present Deane Church and the Quincentenary Celebrations , in connection with which this booklet is issued, are taking place during 1952. Whilst it has generally been understood that 1452 saw the completion of the church of the present dimensions, with tower, nave and chancel, the "Victoria County History of Lancashire" describes a gradual development. This is an interesting account of its growth, and can more readily be accepted when the irregular features of the building are noted- the width of the arches vary, the pillars are not of the same girth, the south aisle is three feet wider than the north aisle, and the arches on the south of the nave are some three feet higher than those on the north. It should also be remembered that many ancient parish churches were originally of small dimensions and were added to during the centuries. Deane Church appears to have been a small 14th century chapel, with the nave the area of the two westernmost bays of the present nave, but without aisles. There was a chancel, possibly in the form of an apse which was common at that period. Though the church was so small it had a tower with walls some four feet thick at the base. It is thought that the tower- not so high as at present- probably belonged to the earlier chapel, and that a difference in the condition of the stone indicates the original height. The tower buttresses were added much later. The chapel had a high-pitched roof, and the line of this original roof can still be traced through the plaster on the wall of the tower. Entrance to the chapel was probably through the tower door- the ground floor of the tower being the porch or baptistry. Towers of those days were strongly built to provide a place of refuge and defence. Arms were often stored there. In the eastern wall of the tower, just under the pitch of the original roof, is a Norman window. Such an opening is not uncommon in old churches. The upper storey of the tower was used as a dwelling-place sometimes by the priest, but more often by the sacristan, part of whose duty was to guard the church's treasures. From the window the guardian could command a view of the sanctuary. Access to the upper storey was sometimes by means of a winding stairway built into the wall of the tower, but more often by means of a ladder. It is possible that at Deane the upper room was reached- part way at least- by the same stone steps built into the tower wall in the south-east corner and which were removed at the close of the last century. Early in the 15th century it is claimed the church was extended eastwards to include an area now occupied by the third and fourth bays. The next alteration to this 14th century church seems to have been pulling down of the northern wall of this extension and extending northwards, making an aisle of the same width as at present. This would necessitate the building of arches, and these two arches are thus the oldest in the church. Later, the chancel and its northward extension were further extended by a bay, and the south side also built outwards with three arches nearly opposite those on the north side. Then, early in the 16th century there appears to have been much rebuilding and extension. The original nave was taken down and the present nave arcade, with its Gothic arches constructed- the aisles being extended westwards. The aisles had lean-to roofs, as shown in an old drawing. Some three or four feet of the original wall remain adjoining the tower. The clerestory was added, and a flat roof constructed with beams and an oak-panelled ceiling. The Victoria History states that the date "1510" was carved on one of the roof timbers. The church would then cover an area of the present nave and aisles, but with no vestry: there was a window in the western wall of the north aisle not wholly removed when the vestry was added- the remaining portion can be seen above the vestry door. A chancel was built soon afterwards, apparently still early in the 16th century. There does not appear to have been any alteration or addition to the church of any consequence for nearly two hundred years, when in 1712 a gallery was erected by Richard Edge, of Middle Hulton ".....from the Great Door at the west end of the south aisle eastward in length seven yards and a half (as far as the parishioners use that aisle belonging to Henry Hilton, Esq.). and in breadth from the south wall six yards and two feet, together with a convenient stairs." About the middle of the century another gallery, called the "Singers' Gallery," was built at the west end of the church. A drawing preserved in the Diocesan Registry Office at Chester shows that this gallery adjoining the tower extended into the south aisle and joined the older gallery. Access to the west gallery was by stairs leading from doors built in the west walls of the north and south aisles and near the outer wall of the aisles. In 1777 a vestry was erected between the north door and the west wall of the aisle. This could not have been a very solid structure, however, for it cost only £4 12s. 2d. Extensive repair to the fabric was carried out in 1807 following a "respectable meeting of the churchwardens, landowners and inhabitants." The roofs of the church and tower were repaired, the floor of the church was levelled and re-flagged, and the exterior of the church was pointed and repaired. The next addition to the church was the building of the present vestry: the minutes of the churchwardens' meeting held April 9th, 1822, record, "It was resolved .....that the vestry be built on the outside, in a suitable manner, that an iron chest be put in it, and that it be filled up with every thing requisite....." In the angle between the tower and the outer wall of the north aisle there was the charnel house, called on an old plan the "Bone House." As the churchyard had then been extended there was no need for this gruesome building, and it was demolished and the "New Vestry" built by Thomas Heaton, stonemason and builder, of Bank Street, Bolton, at a cost of £63 7s. 9d., in 1823. What appears to be evidence of the bone house remains over the stairs leading to the upper vestry. In 1833 galleries were erected over the north and south aisles. To erect them it was necessary to add some five feet to the height of the outer walls, and to give light in the galleries a second row of windows was put in each gallery. In the Diocesan Registry Office at Chester is a plan of the proposed new galleries, which were to be 7ft. 7in. above the aisles, and to have three tiers of benches. William Hulton, Esq., was granted permission to erect a porch at the south-western angle of the church, and from this porch led the stairs to the south gallery. Two stone shields with the Hulton lion and the carved figure of the fisherman were transferred from over the Hulton door to a place over the door of the new porch. During these alterations an iron hinge bearing the date "1412" was found on a door. The erection of these galleries provided 420 additional sittings, making the total accommodation 1,229. At this time there were in the parish, chapels at Smithills, Westhoughton, Horwich, Peel and Farnworth, but additional accommodation was still required because of the increase in population, due in large measure to the Industrial Revolution, which brought many people to Bolton and the districts around. The levying of rates to defray expenses of the church had not met with any widespread opposition for many years, but at a vestry meeting held in the church on 5th December, 1833, there were some who opposed the levying of a rate to meet the cost of erecting the galleries. The number present was so large that the meeting adjourned to the churchyard, where those for the rate arranged themselves on the east of the path, and those in opposition stood on the west. There was a resounding victory for the supporters, and there was much good-humoured chaffing when some who before had denounced the rate assayed to pass over unobserved to the popular side. As we come now to more modern times, it is possible to give greater detail. The Rev. H.S.Patterson, in his booklet, "Notes on Deane Church, Lancashire,"written in 1883, criticises strongly the work which was carried out about 1833. He complains that two-thirds of the ground floor accommodation was rendered defective by the galleries, and suggests that increased accommodation should have been provided by the erection of transepts; stonework in windows and doors was covered with cement; the capitals of the pillars were chopped away rather than alter the woodwork of pews. A chancel reredos was added which did not agree with the windows. (This reredos can be seen in a photograph taken before the restoration.) The chancel floor was raised and any old stones and brasses covered over; and a fine large ancient porch gave way to the present one of five feet in length. In such manner Mr.Patterson criticised the effort made by his predecessor and his parishioners to meet the demands of a people many of whom walked long distances to worship in their parish church. After making this review, The Rev. H.S.Patterson outlined a restoration scheme which, he wrote, "is very modest." A fund was opened, and the restoration of the church was completed in 1884. Older parishioners will have some recollection of this restoration.The early pages of the vestry minute book now in use give a list of donations, and the minutes show how the work went on apace. The churchwardens' accounts presented at the Easter Vestry, 1885, give the cost at £2,700. Thanks were offered to the general public, as well as parishioners, for their support, and an intimation given that further appeals would be necessary. The scheme had at first made provision for the erection of the organ in the eastern bay of the north aisle, but it was later decided to build an organ-chamber, and this was done on the north of the chancel in 1887. The work of restoration and extension that was carried out does not seem "very modest" to us in 1952. The galleries were taken down and the doorways which gave access to them were built up- though the one in the south aisle was not built up on the inside, and the arch of this doorway can be seen behind the panelling in the baptistry. An examination of the pillars shows where it had been necessary to remove part of the stonework to give support to the galleries. The chancel was extended ten feet and the Perpendicular east window rebuilt. A stone tablet under the window on the outside wall records "This chancel lengthened ten feet A.D. 1884 H.S.Patterson, Vicar." The fine oak-panelled roof is an exact reproduction of the old one, and the corbels, partly supporting the roof, are carved figures- some of the old worn corbels remain. It is interesting to note that the year "1884" is carved on the beam above the chancel steps- replacing, it would appear, the carving "1510" on the woodwork of the original oak roof. In building the organ-chamber the window on the north wall of the chancel and the one at the east end of the north aisle were removed. The organ, which was originally in the west gallery, was moved to the new organ-chamber, and choir stalls were erected in the chancel. A new ringing-chamber was built in the tower, the ringers having previously rung from the ground floor. The square pews that remained were replaced by the present straight open ones. The pulpit, which has stood at the north side of the nave, was lowered and moved to the position at the south side, previously occupied by the clerk's desk, and the front of this desk was fastened to the wall behind the pulpit. The lectern was moved from the centre of the chancel steps to its present position on the north side. As restoration of many windows is now urgent, it is interesting to read that an estimate of five pounds was submitted in 1884 for the renewal of the easternmost window in the north aisle. Such work would now cost about two hundred pounds. The church was reopened by Dr. James Fraser, Bishop of Manchester, on December 22nd, 1884. On May 20th, 1946, a meeting of parishioners decided to erect a baptistry as a war memorial to the men of the parish who gave their lives in the Second World War, the money to be raised by direct gifts. This form of memorial commended itself as being "the erection of something in the church in our generation- a contribution to the history of the church." Owing to unavoidable delays due to the difficulties of post-war years the work was not begun until 1950. The font was moved from its position in front of the tower arch and now occupies a more appropriate place in the baptistry near the main entrance to the church. The baptistry was dedicated by Rev. Canon R.C.Worsley on December 17th, 1950. It is a worthy memorial and evidence that there are still craftsmen skilled in wood-carving. It adds a quiet dignity to the church. The names of the fallen are carved on a panel facing the entrance. The cost was £850, which information is given for comparison with the cost of restoration in 1884. Such is the story of the building of this ancient church, erected by local builders, who in all probability were directed and assisted by monks from Whalley. Much of the history is supported by evidence. In the absence of tangible evidence the historian often resorts to conjecture suggested by his knowledge of what was customary. It was, for example, a common practice to build a church on the same site, or very near the site, of an older one, which prompts the question; Was the small chapel (the size of which has been indicated) built on the site of, or was it perhaps actually, the original chapel of Saynte Mariden with its smaller tower? It is interesting at least to think on these things, guarding always against offering surmise for fact. 1. Extract from the will of John Hulton of Farnworth, Esq. "The 5th day of the month of November in the year of our Lord, 1486, I, John Hulton, of Farnworth, Esquire, sound of mind and of sound memory, made my testament and last will. First I bequeath my soul to Almighty God, the Blessed Mary, mother of Christ, and to all the saints, and my body to be buried in the parish church of Deyne. ........Item I bequeath and give 20 marks to build a chapel on the north part and side of the said Church of Deyne........"
The work of building was not carried out by the testator's brother, to whom it had been entrusted, but by his brother's son. In the absence of further record one wonders if this chapel was the addition of the aisle (or part of it) previously mentioned as having been built about this time, or perhaps just the erection of a chapel in the aisle already built. It has been suggested that the third pillar from the tower in the north aisle, of larger girth than the others, shows evidence of such an erection; though it is also claimed that the clumsy thickening of this pillar and the awkward way in which the western arch springs from it shows the junction of the earlier work with the 15th century work of the nave. This John Hulton, of Farnworth Hall, who made this bequest to his parish church, was of the parent stock of the Hultons. 2. In the Public Records Office is preserved the Petition of Richard Heaton, of Heaton, praying the Chancellor of the Duchy of Lancaster to command certain parishioners of Deane to appear before the King's highness in his Duchy Chamber at Westminster. In this document we learn that Richard Heton of Heton had caused to be built an aisle in the parish church of Deane and borne the greater part of the cost himself, and also that within the same aisle he had built a chapel of timber dedicated to the Holy Trinity and St.Anne. He cites certain men and "dyvers other evill disposed and riottouse persons to the nomber of xxvj (26) arrayed after the manner of warr, that is to say with swords, buklers, bills, bowes and arrowes and other weapons....." who on the 24th day of August, 1522, "......in the nyght tyme about thre of the clok in the mornyng in riottouse warlyke and unlawfull manner entered into the seid church called Deene Churche and then and there riottously pulled and cutt down as well all the tymbre worke of the same chappell also the auter (altar) and posts whereupon the ymages of the Holy Trynytie and Seynt Anne stode......"
It is interesting to note again mention of the building of an aisle and chapel. In the Heaton Chapel- still so named, though no screen or other division now exists- is the ancient piscina in the pillar in the north aisle adjoining the chancel. It will be noticed that the church is no longer named "Saynte Mariden," but "The Parish Church of Deyne" and "Deene Churche." Until the Reformation Deane was part of the Diocese of Lichfield, which included the north-west of England and most of the Midlands. Henry VIII founded a number of sees, and in 1541 the Diocese of Chester was formed, including Lancashire and Cheshire and parts of North Wales, Westmorland, Cumberland and Yorkshire. It was not until 1847 that the Diocese of Manchester was formed, Dr. William Derrick Lindsay Greer being the seventh bishop. The altar at Deane is unique. The frontal is of carved oak, the centre panel depicting "The Martyrdom of George Marsh, at Chester April 24th, 1555".... the scene being adapted from the printin Foxe's Book of Martyrs. Above the martyr's head is shown the barrel of tar to which the records refer. Over the scene of martyrdom is carved, on two streamers, "Via crucis" and "Via lucis," that is, The way of the Cross, The way of Light. Over the panel is carved a small chalice and the design of a vine interwoven with ears of wheat. On the other four panels are carved and guilded the symbols of the Evangelists on red shields- St.Matthew - a winged man; St.Mark - a winged lion; St.Luke - a winged ox; and St.John - an eagle. It may be thought that the scene of a burning at the stake is not exactly a fitting subject for the Holy Table, but it must be remembered that it was because of his denial of the doctrine of Transubstantiation and for his protest against the denying of the Cup to the laity that George Marsh suffered at the stake. The reredos too, is unusual in design and detail. It is a copy, in oak, of the sedilia at Furness Abbey, and was erected in 1886 "To the Glory of God and in memory of James Fraser, D.D., Lord Bishop of Manchester, 1870-1885," as recorded on brass tablets. Bishop Fraser was the second Bishop of Manchester. Along the top are carved and guilded the signs of the Passion- Judas's bag, whipping post, torches, reeds, crown of thorns, coil of rope, cross surmounted by crown, ladder and spear, sponge, raiment, robe, dice, hammer and nails. In the centre is a pelican. This bird has been regarded as a symbol of Christ since the early days of the Church. It was thought that it fed its young from blood taken from its own breast. It is often shown with beak stained red, and breast bare- as can be seen on the sedilia in the south wall of the sanctuary. On the pillars of the reredos are small carvings of various forms of the Cross and the initial I.H.S. (an abbreviation of the Greek word for Jesus). THE FONT AND THE BAPTISTRY. Like the church itself, the font is plain and simple in design, such as is usually found in old village churches. Its position in front of the tower arch was right when the entrance to the church was through the tower door, but it is now more appropriately placed in the baptistry near the south and main door. On the screen over the entrance to the baptistry are carved the escutcheons of the Heaton and Hulton families, and inside the baptistry the Tempest escutcheon and the familiar one of the Borough of Bolton. Heaton- Argent on a bend indented sable three bulls' heads erased of the field. Hulton- Quarterly 1st and 4th argent, a lion rampant gules, armed and langued azure (Hulton of Hulton); 2nd and 3rd argent, a lion rampant gules, crowned or, armed and langued azure (Hulton of Farnworth). The small silver shield denotes that the present owner of the coat-of-arms is a baronet: the shield bears a sinister hand erect and apaumee, couped at the wrist gules. On a quartered coat it is placed in the centre chief point, over the junction of the quarterings. Tempest- Argent, a bend between six martlets sable, an annulet or. Borough of Bolton- Gules, two bendlets or, a shuttle with weft pendent between an arrow point upwards and a mule spinning spindle in chief palewise all of the last, and an escocheon in base of the second, thereon a rose of the first, barbed and seeded proper. Pulpits were seldom found in parish churches in the early Middle Ages: the people were taught scriptural stories by means of miracle and morality plays. The pulpit at Deane is probably the original one and belongs to the Elizabethan period. Much of the finest wood-carving in churches was done during the Renaissance period, which began in the 15th century. During the 16th century the carving was more elaborate, and our pulpit is of this more extravagant design. They were often moveable, and a picture of the interior of Deane Church shows our pulpit in the centre aisle in front of the chancel as late as 1850. It is shown standing higher than it does now, and supported by a rail that joined it to the reading or clerk's desk, which then stood in the place now occupied by the lectern. This same reading desk, with its carving of a chalice in the centre of the panel, is now fastened to the pillar behind the pulpit. The brass lectern in the form of an eagle was presented to the church in 1877 by W.W.B.Hulton, Esq. The church possesses some beautiful stained-glass windows. In the north aisle are windows in memory of Miss Elizabeth Heelis, a Sunday School teacher, died 1865; Jane, wife of James Greenhalgh, solicitor, died 1881; George Marsh the Martyr: John Kynaston Cross, mill owner, Member of Parliament for Bolton, and Under-Secretary of State for India, died 1887. In the baptistry is a window in memory of James Edward Bowden, sidesman, who died 1932, and his wife Clara. In the south aisle is a second window to Miss Elizabeth Heelis. Next is the window in memory of those from this parish who gave their lives in the war of 1914-1918. The four figures are those of Saint George, Saint Patrick, Saint Andrew and Saint David. In the Hulton Chapel is a window erected to the memory of Sir William Hulton, first baronet, who died 1907. The window in the east wall of the chapel is very old. It shows the family coat-of-arms already described, with crest- a stags head; and also the Hulton quartered with another. The east window is a seven light pointed window with Perpendicular tracery in the head, portraying Christ and the Apostles, including St.Paul. The window, by William Warrington, of London, is reputed to be one of the best imitations of ancient stained glass in the country. Rev. E.Girdlestone appealed for stained-glass to be put in the east window as "an ornament to our venerable and ancient church and as a personal kindness towards myself." William Hulton, Esq., in an eloquent speech denounced this as a return to the idolatrous days before the "glorious Reformation." He said:"In the house of God, everything ought -according to the Apostle's injunction- to be done decently and in order, but it does not appear to me that stained glass at more than £260 is requisite for these qualifications of a Protestant place of worship in a country village." Fortunately, his pleading did not prevail, and in 1845 stained-glass was put in. The window in the south wall of the chancel is the "Tempest Window," and was restored about the time of the restoration of 1884. In the centre of the window is the coat-of-arms of Baroness Beaumont, and its description is:- Quarterly 1st and 4th argent, a lion rampant sable Stapleton; 2nd and 3rd argent, two bars and in chief three escallops azure. Errington Supporters- two talbolts argent each with an ear slit and dropping three guttees de sang gules. The lozenge-shaped shield indicates arms held by a lady in her own right. The coronet surmounting the shield and showing four pearls signifies the peerage. Impaled in the centre of the Beaumont coat-of-arms is the escutcheon of her own family- the Tempests, as described earlier. Here follows a list of memorial tablets in the church, some of the older ones with obituaries. Some of those commemorated were buried in vaults beneath the church, some in the graveyard, the others outside the parish. 1. Dorning Rasbotham, of Birch House (Farnworth), died 1791, also Sarah, his wife, died 1805. 2. Elizabeth, wife of Edward Cannon, of Greenhill, Deane, died 1876. 3. Lieut.-Colonel Henry Hulton, of Preston, died 1831. Louisa Caroline, his wife, died 1863. Henry William, their eldest son, died 1836. Anne, sister of Lieut.-Colonel Hulton, died 1830. On the wall behind the Vicar's stall is a tablet in memory of John Young Alexander Line, 2nd Lieut., only son of Rev. J.R.Line, buried at Merville, 1916; and one to the memory of Lawrence Catterall Worsley, the younger son of Canon R.C.Worsley, died 1933. In the sanctuary is a tablet erected to the memory of Rev. H.S.Patterson, who died 1916. Roger Holland, of Birch House, died 1832.
and Roger, his son, died 1832. On a panel in the baptistry are inscribed the names of forty-three men and one woman of this parish who gave their lives in the Second World War. In the south aisle is a tablet in memory of Thomas Boardman, secretary of the Sick Society, died 1931. On the brass tablet near the war memorial window are the names of one hundred and twenty-one men who gave their lives in the Great War of 1914-1918. 1. Georgina Maria Clough, youngest daughter of William Ford Hulton, died 1864. 2. William Rothwell Hulton, 2nd baronet, died 1943. 3. Hugh Thurston Hulton, died 1862. 4. Sarah Matilda Hulton, only daughter of Ralph Rothwell, wife of William W.B., eldest son of W.F.Hulton, died 1873. 5. Rear Admiral Edward Grey Hulton, younger son of William Ford Hulton, died 1923. 6. Alan Edward Grey Hulton, only son of Rear Admiral Edward Grey Hulton, died from wounds, 1915. In the wall of the south aisle, near the Hulton Chapel, there is a small marble tablet which reads "Juxta hoc sepulchrale marmor, Pietatis ergo et memoriae positum, Reliquias suas condivoluerunt, Plurima de stirpe Hultoniana," which, translated, is: "Near this sepulchral tablet, erected as an affectionate memorial, a great number of the Hulton family have caused their remains to be interred." The Hulton documents suggest that interments other than the Hultons have been made in the chapel. Of several applications for such burial is one dated 7th April, 1676, in which Robert Reeve, of Westhoughton, yeoman, asks leave of William Hilton, of Hilton, Esq., to inter the body of James, his son, in Mr.Hilton's chapel in Deane Church. 1. William Hulton, who died 1741, which has the arms of his wife, Mary Leigh, of Westhoughton, impaled with his own. 2. William Hulton, who died 1773, son of the above. This hatchment shows several quarterings of coats-of-arms, and in the centre, on a shield of pretence, the arms of his wife, Ann Hall of Droylesden. 3. William Hulton, who died 1800, son of the last-named William Hulton. This shows his arms impaled with those of his wife, Jane Brook, of Mere. There are two small effigies -wooden plaques- of knights in armour, each with the Hulton lion carved on the shield. They are obviously very old, as can be seen from the condition of the wood, and as the subject of the memorials would indicate. The white ensign was Admiral Hulton's flag; replicas of his medals are fixed on his memorial tablet. On the front of the carved door to the Hulton pew a tablet reads: "This door was removed from the ancient pew of the Hulton family in the collegiate church of Manchester A.D. MDCCCXLVII," and in the centre of the door is the Hulton shield. "William Ford, born XIX Septr MDCCCXI." On this day Deane Church was re-opened after the removal of the galleries, the renewal of the roof, the extension of the chancel, and general restoration. William Wilbraham Blethyn Hulton of Hulton Park and Margaret Lucy, his wife, were permitted by the Grace of God to attend the opening services with his four surviving children....." of whom the eldest was "William Rothwell born XVI Feb. MDCCCLXVIII." The refitting of the Hulton Chapel and the rearrangements of the pews assigned to the Manor of Hulton were carried out at the expense of William W.B.Hulton, Esq. For many years there had been a private door leading to the Hulton Chapel. Reference to this is found in the following letter: "We the Churchwardens for the different Hamlets or Townships within the Parish of Dean according to our Resolutions passed at a Parish Meeting Held in the Church at Dean the sixth day of November 1766 Do petition William Hulton Esqr of Hulton Park to allow the Parish Liberty to pafs through his door on the south side the Church as witnefs our Hands......" and signed by seven churchwardens. During the restoration, by agreement with Mr.Hulton, this doorway was built up on the inside, as it was considered draughty; the door itself still remains. About this time too, the screen round the chapel was erected. The pews are very old. The rough-hewn benches, though now much worn, still show the adze marks, whilst some are crumbling with age. Originally the word "pew" was given only to the square enclosure, erected, cushioned and curtained, and appropriated by persons of distinction. Old prints show the square pews which were in the Hulton and Heaton chapels, and at the front of the nave, until the restoration of 1884. Pews in the west gallery had been purchased by individuals, and for many years were considered private property. They were leased at a yearly rental or sold by the owners. An indenture dated November 19th, 1804, states that "In consideration of the sum of o10 paid to me by Richard Gregory of Over Hulton, farmer, I have granted, bargained, sold and confirmed unto the said Richard Gregory all that pew in the middle row of the new gallery, in the Parish Church of Deane, being the third pew from the front of the said gallery, for the purpose of sitting, kneeling, and hearing divine service there, on Sundays and holy days ......"
Lord Francis Egerton ....39 "
William Hulton, Esq. ....70 "
And that in future all repairs of the church be paid for in the above proportions instead of as heretofore in equal shares." Two pew-ends on each side, at the beginning of the centre aisle, have interesting carvings. The small holes bored in the ends of pews were to hold candlesticks. After 1884 all seating was "free." Before the introduction of organs into churches the choir usually occupied the back of the church, and accompaniment was provided by various musical instruments. At Deane part of the west gallery was reserved for the musicians. In 1801 "a viollincello for use of the singers" cost £7 17s. 6d. In 1805 two hautboys cost £4 4s. 0d., and in 1816 £9 11s. 0d. was paid for a trumpet. In 1827 they were sold for £12 12s. 0d., an organ having been bought and erected in the west gallery. A framed printed notice hanging in the vestry record: "On Sunday, Sept. 10th, 1826, the new organ will be opened in the Parish Church of Dean and a Sermon preached by the Bishop of the Diocese." The organ was repaired and enlarged in 1878 by Harrison, of Rochdale. In 1887 it was removed to its present position in the new organ-chamber. In 1901 it was rebuilt and new stops added by Messrs. Alec Young, of Manchester, and in 1947 it was again overhauled and improved by Henry Willis and Sons, Ltd., of Liverpool, at a cost of £762. The organ-screen was designed by Rev. H.S.Patterson- the initials H.S.P. appear on the screen. An unusual feature is the small carved scroll above the console on which is scored the music of the National Anthem. The handsome brass candelabra which hangs in the nave was purchased in 1737 following a parish meeting at which the wardens were authorised to purchase "a decent brass candlestick to be hung up in ye parish church for ye perpetual wish of ye said parish." It was removed temporarily in 1878 when the church was lighted by gas. It has recently been repaired and gilded. Fittings on several of the beams show how its position has been changed from time to time. The screen under the tower arch was designed by Rev. H.S.Patterson and carved by Mr.Peters, a local craftsman, in the old vicarage. The pointed door in the north aisle is a fine example of the rough durable work of some village craftsman. It is thought to be of 13th century date, being the original tower door, and moved to its present position when the new entrance to the tower was constructed. The Rev. H.S.Patterson found the coat-of-arms stored away. It was soon after his institution that the advowson was purchased by the Simeon Trustees, and he re-hung the coat-of-arms, which will remind future generations that the patronage of the living had for so long been vested in the Crown. It had at one time been directed that the Royal Coat-of-Arms should be placed in full view of the preacher as a warning that he speak no word derogatory to the Crown. A chalice with the London hall-mark of 1547. It is plain and without inscription except that "Deane Church" has been inscribed on the base in recent times. A paten of 1901, Birmingham make, inscribed, "The gift of Mrs.Elizabeth Marsh unto the Parish Church of Deane in Lancs. on the Coronation of Ed VII June 26, 1902." During the investigation at Deane it was found that a chalice which had been in the custody of Adam Hulton, Esq., had been stolen. Lambert Heaton claimed a chalice and suit of mass vestments, which were in the church, as heirlooms. It would appear that these were the chalice and vestments provided by Richard Heaton for use in the chapel of timber dedicated to the Holy Trinity and St.Anne. It is interesting also to read that a "chalese" and vestments were found in "ye custodie of Sir James Laithwaite," who was described as "our Lady's prest." It is suggested that this chalice and vestments were those claimed by Lambert Heaton, and that James Laithwaite was chaplain to the Heaton family- "Sir" was a curtesy title. Assuming that Lambert Heaton's claim was allowed, it would appear that the remaining chalice was the one with the mark of 1547 still in our possession. A fac-simile of the original 1662 copy of the Prayer Book. The Book of Homilies, 1623. Foxe's Book of Martyrs, 1641. A Charles II Prayer Book, 1669. The Works of Bishop Jewell, 1631. Burnet's History of the Reformation. The History of John Bradford, also the Life of Rev. Rich. Rothwell. Likewise The Life and Martyrdom of George Marsh- printed in Bolton, 1787. Rev. H.S.Patterson engaged a local artist, Mr. S.Towers, to paint portraits of certain prominent divines. They included Venerable Bede, Aiden, Dunstan, Langton, Wycliffe, Cranmer, Ridley and George Marsh, and they were hung on the walls of the nave and one on each side of the Holy Table. They are now stored in the muniment room. PORTRAITS, etc., HUNG IN THE VESTRY. Rev. Francis H. Thicknesse, 1855-1868. Rev. Henry Sheridan Patterson, 1877-1911. Rev. John Russell Line, 1912-1927. Canon Robert Catterall Worsley, 1927-1950. There are several old paintings, prints and photographs of the church- of the interior, one dated 1850, and another undated; of the exterior, one dated 1835, and one undated but painted before the galleries were erected and showing a porch larger than the present one; and one very old so that it is almost indistinguishable. CHURCHWARDENS' STAVES AND THE MACE. The six silver-mounted churchwardens' staves add dignity on special occasions. Two are inscribed 1844, two 1877, and two 1904. The mace or verge which the sexton carries before the preacher was presented to the church by friends of Ald. John Miles when he became Mayor of Bolton in 1901; he was organist for fifty three years. It is surmounted by a silver pelican, and at the base is a monk's head with a shield inscribed, "Hominum Piscatores" (Fishers of men), the motto of Whalley Abbey. The names of two churchwardens were inscribed on each bell. The sixth reads: "James Rothwell, vicar: W.Worthington, C.W. : Richard Sanders made us all 6: 1718." It was in 1843 that the hipped roof of the tower, which was covered in stone flags, was replaced by a flat roof covered with lead. The pinnacles on the tower were given in 1844 by Peter Ainsworth, Esq. of Smithills, M.P. for Bolton. From ground level it can be seen that the carvings are of men's heads, but a closer view shows that they all make play with protruding tongues- one on the south-east pinnacle being the "winner." It is unusual to find carvings of this nature done about churches so late as 1844, but it is probable that they were carved to match the pinnacles on the eastern wall, which are of an earlier date. The present clock was installed in 1816 at a cost of £90. The maker was W.Leigh, Newton, Lancs. The carved stone figure of the head and shoulders of a man, built into the outside wall near the porch, has weathered many a storm. As previously stated, he was originally fixed over the Hulton door. With his fingers in its mouth, he carries a fish slung over his shoulders. It is thought that he represents the "fishers of men" of the Whalley Abbey motto, and it may reasonably be assumed that a monk of the abbey was the sculptor. Actually the fishes of the coat-of-arms were whales and were chosen as a play on the place-name, Whalley. Such arms are known as "canting arms." In the records there does not seem to be any reference to the churchyard since the very early one of 1276 until 1668, when some parishioners, having objected to paying a church rate, George, Bishop of Chester, decrees its legality and orders the levying of £26 "for Souging (soughing) and making dry the Church and Chyard of Deane." The earliest mention of an extension of the ancient burial ground appears to be in a record, dated 1796, of a "Bargain and Sale" to Rev. Robert Latham for ten shillings apiece to Henry Blundell, Esq., William Hulton, Esq., and John Blackbourne, Esq., a plot of land, a part of Dean Moor, adjoining the churchyard, 3,926 square yards in extent, for the use as a burial place. And later, Rev. Robert Latham petitioned the Bishop of Chester "That by the Increase of Inhabitants within the Parish of Dean the yard of the Parish Church of Dean aforesaid being Rendered insufficient for the convenience and decent Interment of the corpses or dead bodies of persons....." and so he asks that two pieces or parcels of land totalling 4,667 square yards be consecrated. The extent of the original churchyard on the north side of the church is marked by the first line of lime trees. The first addition to the north was in 1857, when land, somewhat less than half an acre, was enclosed by a hedge in which was planted the second line of trees. Further northward extensions followed in 1876, 1896, 1921, 1928; in 1940 part of the old vicarage garden was consecrated, and at the present time arrangements are being made to add more of the old garden to the churchyard. Tradition also says that the gravestone near the north-east corner of the church and several a few yards to the east with a hand carved on them, mark the graves of Hugenot glovers. Whilst there is no real evidence that the persecuted Protestants of France and Flanders came, in the 17th century, so far north as Bolton, the belief is persistent, and the Flemish wooden sabot is claimed to be the prototype of the Bolton clog. There may be some unknown connection between these graves and Hugenot settlers, but an examination of the registers does not help. The inscription on the first grave is "Rebecca Baron 1705" and the burial register records that she was the daughter of Elizabeth Baron, of Little Hulton. The carving on the stone represents the digit finger pointing, which is thought has some religious significance. Several Deane vicars were buried here. The grave of John Tilsley is alongside that of his wife by the yew tree. The original stones being broken, other stones with the inscriptions reproduced have been erected over them. In the same way a second stone covers the grave of John Harpur, Vicar of Bolton, a contemporary of John Tilsley. Richard Hatton was buried at Deane; his gravestone near the south-west corner of the church names, in Latin, his three wives and three children. In the grave to the left was buried his second wife, Mary Okay, niece of the well-known Puritan, John Okay. James Rothwell was buried in the same grave as his wife in the centre aisle near the chancel. Their son Richard, at one time curate to his father and later Rector of Sephton, near Liverpool, was also buried in the same grave. Robert Latham, though buried at Wigan, is, strangely enough, commemorated on the same gravestone as Abraham Boardman, who was parish clerk, and also schoolmaster, which latter appointment was begun in the old school opposite the lychgate in 1799. This stone , next to that of Richard Hatton, is known as "the dropsy stone," the reason being evident on reading the inscription "..... Twenty three times I tapped was...."
The old yew tree, it's trunk and branches now covered with ivy, has been dead for many years, though it still stands, a relic of the centuries gone by. In its time it has undoubtedly provided many a log-bow for Deane archers. It was for this purpose that Edward III ordered the planting of yews in churchyards throughout the realm. The pedestal sundial was erected in 1819. It had the name of the maker (W. Leigh, Newton), and the latitude and longitude, but the markings are now illegible. The pillar was brought from Westhoughton Chapel. THE GEORGE MARSH MEMORIAL CROSS. George Marsh was born at Broadgate in the year 1515. His father was a farmer. He attended either Bolton Grammar School or a school in Farnworth. He became a farmer and married at the age of twenty-five. After the death of his wife he left his children in the care of his parents and entered Cambridge University. Here he associated with several ardent advocates of the reformed faith. He attached himself to one Lawrence Sanders. After preaching in various parts of the country he became curate to Sanders at All Hallows Church, London. When Sanders was arrested, George Marsh came north and preached the Protestant faith at Deane, Eccles, and elsewhere. Learning that Justice Barton, of Smithills Hall, had sent servants to arrest him at his mother's house, in spite of his friends' earnest entreaties, he gave himself up at Smithills. Local fervour was so great that the story was told of Marsh stamping his foot with such determination that the imprint of his foot remained on the stone flag. The story became traditional, and a stone with the mark of a foot, protected by iron bars, is still inspected by visitors to Smithills Hall. The story of George Marsh is included in Foxe's Book of Martyrs. Solidly built of stone, there must be few such lychgates in the country. An inscription over the entrance reads, "The House of God and it is the Gate of Heaven." Inside the building a brass tablet records, "To the Glory of God for national mercies throughout successive generation, and in memory of Thomas Withnell, Vicar of Deane, A.D. 1767-1776. This Lychgate was erected by Ellen Low Ashton, A.D. 1903, H.S.P., Vicar." At the entrance are carved heads of King Edward VII and Queen Alexandra, and on the archway facing the church those of Rev. H.S.Patterson and Miss Ashton. The lychgate was erected in such dimensions that it might shelter such mourners who do not use the church. Miss Ashton was a decendant of Rev. Thomas Withnell, who was buried at Wigan. The stone pulpit, from which outdoor services are conducted on Sermons Day, was erected by relatives of Rev. H.S.Patterson, during whose vicariate so much work was done in and about the church. It is known as The Patterson Pulpit. 1230	William de Eccles, junior. 1290	Thomas, "persona de la Dene." Rev. Richard Hardie was appointed by Charles I in 1636. He made entry in the registers against several couples, "Others I have hard have privately been married by old Mr. Pendlebury, but not lawfully (because he had not been) allowed by either God nor man, theirfore (all who have been so married are not entered by me)." Rev. Alexander Horrocks, a native of Turton, was curate and lecturer under Richard Hardie. He was esteemed by many, but spoken of by the Cavaliers after the taking of Bolton as "that old rogue Horrocks that preaches in his grey cloak." He became minister of Westhoughton Chapel in 1643. Rev. John Tilsley, who also was curate under Richard Hardie, was made vicar by an Order of the House of Commons in 1643. His father was a tanner at Westhoughton. John Tilsley was a well-known Presbyterian. Presbyterianism was established by Parliament in 1647, and was accepted in an area round Manchester, but not in most parts of the country. During the Civil War, John Tilsley was with the Parliamentary forces, whether as chaplain or not is not clear. His letters were all of the progress of Sir John Seton's soldiers. The Royalists said of him that at the taking of Wigan he hung the communion plate of the parish church round his neck, saying it had served a popish idol. After the Restoration he was three times ejected fromthe living for not complying with the Act of Uniformity, and was once imprisoned in the Tower. He continued, however, to serve along with his successor, and resided at the Vicarage. Rev. John Angier was appointed by Charles II in 1663. He was educated at Cambridge, from where he was expelled, and went to America, where, in spite of his wildness, he took his M.A. degree at Harvard. He married in America and, returning to England, was appointed by the Presbyterian Classis to minister at Ringley, though not without some misgivings because of his previous conduct. From Ringley he came to Deane. Some serious complaint was made against him, and, rather than risk suspension, he resigned the living in 1672. Rev. Richard Hatton was appointed by Charles II to the living in 1673. He received his earlier education at Bolton Grammar School. There is some uncertainty about the date of his induction. For some time there was an attempt to retain the living for Angier, who was in sore straits, and Hatton's own family recorded on his gravestone after his death in 1712 that he had been vicar of Deane only for 35 years, that is since 1677. In the midst of religious controversy and persecution in the name of religion, which united Nonconformists and Roman Catholics against the Established Church, Vicar Hatton seems to have kept the even tenor of his ways. Near the end of his life it was written of him, "He preached against the sins of the times, and before the sermon he prayed for the Queen (Anne). He was a man of unblameable life, not a frequenter of taverns; no gamester, swearing, railer or quarreller; not noted to be an intemperate drinker, grave and decent in his apparel, and in his behaviour he carried himself as becometh the gospel." Rev. James Rothwell was appointed vicar by Queen Anne in 1712. He belonged to the same stock as the first vicar appointed by the Crown. Like Richard Hatton, he was educated at Bolton Grammar School. Two years after leaving Oxford he was appointed to the living of Deane at the age of 24, and held that same office until his death in 1766. He showed unbounded enthusiasm for the work of church and parish, remaining aloof from all political matters. He applied himself to the business side of the church, as well as the spiritual, himself writing the minutes of meetings and also keeping the churchwardens' accounts. Both his minutes and accounts are a source of much detailed knowledge of parochial affairs. He found time, however, to ride to hounds with the gentlemen of his parish. Rev. Robert Latham was a young man when he became Vicar of Deane in 1777. Throughout his vicariate of 41 years he seldom presided at churchwardens' meetings. He did, however, devote himself most assiduously to his pastoral duties and won the esteem of all his parishioners. He lived a simple life: he allowed the farmer of the glebe- whose family were hand-loom weaver- top share the vicarage. He was a held in repute as a preacher and scholar, and was appointed a King's preacher by the Bishop of Chester. He refused to preach a sermon for the benefit of the Sunday School, maintaining that it was the duty of parents to teach the catechism to their children and to bring them to church on Sundays, when the clergy would test their knowledge. Rev. Thomas Brocklebank, curate of Bradshaw, became Vicar of Deane in 1818. He soon became greatly interested in the parish school. Built in the early years of the 17th century, it still stands -though much dilapidated- immediately opposite the lychgate. It must have been an occasion of deep satisfaction to the vicar when a new school of two storeys was built in 1820. This was the stone building now used as an Infants' School. The present brick building- still spoken of as the "new school" by older parishioners- was erected in 1882. Rev. Thomas Brocklebank resigned the living owing to ill health in 1829. Rev. Edward Girdlestone, nominated by George IV, was instituted Vicar of Deane in 1830. Immediately after leaving college he became private tutor to William Ford Hulton, eldest son of William Hulton, Esq. He also had other private pupils. In 1829 he was appointed a curate at Deane, and became vicar when Thomas Brocklebank resigned the living. He was interested in the work of Day and Sunday Schools in his own parish and further afield. He preached a course of four sermons on "George Marsh, the Martyr of Deane," which aroused so much interest that he was persuaded to publish them. A copy of the book is now included in our library. He was appointed Canon of Bristol Cathedral in 1854, and resigned the living of Deane the following year. Rev. William Bashall, curate of St.Anne's, Highgate Rise, London, was instituted Vicar of Deane in 1868. His wife was a niece of John Hick, Esq., who for many years was M.P. for Bolton. A few weeks after his institution he presided over a vestry meeting at which a church rate of a penny in the pound was voted for church expenses. This was the last time a compulsory church rate was levied at Deane, for Parliament abolished the rate the same year. At a subsequent vestry meeting it was decided to raise the necessary funds to meet church expenses by introducing a seat rate. In addition it was resolved that non-parishioners burying at Deane should be charged double fees, half the extra fee going towards church maintenance. With the abolition of the church rate, Little Hulton and Westhoughton ceased to contribute towards the expenses of the Parish Church, though Little Hulton continued to send a churchwarden to Deane up to 1874. In a letter concerning church finances William Ford Hulton, Esq., wrote of the vicar as "...our excellent and highly-respected vicar, who has endeared himself in every way since he came into the parish to every member of his congregation...." Owing to failing health Rev. W.Bashall resigned the living in 1876. Rev. Henry Sheridan Patterson was appointed to the living of Deane in 1877 by the Lord Chancellor "in full right on behalf of the Crown." This same year the advowson was purchased by the Simeon Trustees. From 1862 to 1865 Mr.Patterson had been a missionary in India. Before coming to Deane he was Rector of Great-with-Little Bartlow, Cambridgeshire. Many of our parishioners and others outside the church remember Rev. H.S.Patterson, and the account of the work carried out during his time is evidence of his zeal for the well-being of the church. He resigned the living in 1912. Rev. Robert Catterall Worsley came to Deane in 1927, being at that time Vicar of Holy Trinity, Horwich. After a short time the house in Junction Road was bought to serve as a vicarage. In 1934 the old Deane Church House was taken down, and Deane Parish Church Memorial Hall erected as a memorial to the fallen in the Great War of 1914-1918. The old Deane Church House, a corrugated-iron structure, had been opened in 1904: it had originally been a church in Blackpool. It was to be "a house where good association and councel will afford youth the sympathy and guidance it so much needs." The present commodious hall is admirably provided to serve the social needs of he parish. Rev. R.C.Worsley was appointed to Honorary Canon of Manchester Cathedral in 1935, and in 1948 he became Rural Dean of Bolton. His many activities in parochial affairs, his service in the cause of education, and his work in the diocese, particularly as Warden for the Readers, are known and appreciated in and beyond the parish. In 1950 Canon Worsley was offered and accepted the living of St.Peter's, Tiverton, North Devon. Rev. Kenneth Mackay Bishop was Rector of St.Paul's, Kersal, from where he came to Deane in 1950. He has recently been appointed Proctor in Convocation, and appears to be the first Vicar of Deane to hold that appointment. In this short history we refrain from writing further of the vicariates of Rev. J.R.Line, Canon R.C.Worsley and Rev. K.M.Bishop. When the Sexcentenary of Deane Church is celebrated they and our times will have merged into history, and some writer will find ample record of church and parochial affairs in the minutes and accounts of the Parochial Church Council since the passing of the Parochial Church Councils (Powers) Measure in 1921. In addition to the vicars there have been, throughout the centuries, many assistant clergy ministering in this large parish. It has already been seen that several curates were employed at the same time. It is recorded that five clergy in the parish signed, in 1641, the National Protestation- a promise to maintain the Protestant religion. The list included the vicar Richard Hardie, John Tyldsley (Tilsley), Thomas Johnson of Deane, Alexander Horrocks of Westhoughton, and James Walton of Horwich. In 1592 it was recorded in the Visitation Book of the Bishop of Chester that the curate at Deane did not catechise and that the "annual perambulations" were neglected. The temptation at least to curtail this latter duty -the beating of the bounds- can be appreciated when the extent of the parish is considered. Nor did the churchwardens escape admonition for the neglect, and they were reminded also that the shilling fine must be levied on all who absented themselves from church on Sundays and other holy days. The curate upon whom this censure fell was James Pendlebury, officiating in the absence of the vicar. In some cases local squires maintained wholly or in part their own chaplains. The will of John Hulton, of Farnworth, which, it will be remembered, provided for the building of a chapel in the north aisle, also made provision "....that a chaplain be perpetually found to celebrate for my benefactors...." The will was executed by John Hulton's nephew. It would seem that the chapel may have been built as a chantry, in which case it would be demolished by order of the Duke of Somerset under Edward VI and the money confiscated. In the muniments of the Hulton family, deposited in the Record Office at Preston, is a letter concerning a chaplain maintained apparently by the parish, but serving also at Hulton Hall. The letter, addressed to Henry Hulton, Esq., is endorsed, "a letter found in the Highway 1709 concerning Mr.Howard." It states "...We are sorry to write to you on this occasion and tell you that all our townshipp is very much displeased at you for keeping Mr.Howard at Dean Church. One half of Farnworth and Kersley and Middle Hulton and more goe to Wharton Hall and to Mr.Burns ery Sunday ...you seem very much against Presbiterians.... People say that it is a hard matter that Dean Parish must keep you a chaplain, and too one that dishonoureth your Brother at Manchester with big talk.... We do not say this to anger you at him but for you to get him out of your house and then the Vicar says he will turn him away...."
The writer, as might be expected from the surreptitious means employed to effect delivery and by the tenor of his communication, preferred to remain anonymous. Whether there was justification for the complaint or what was the outcome is not known. After the Reformation people generally in the north-west of the country adhered to the old faith and its observances, but the folk of Deane and hereabouts -apart from some of the landowners- were strong advocates of the Protestant teaching. When the twenty-six men of Deane ruthlessly struck down the images and pulled down the altar in the Chapel of the Holy Trinity and St.Anne, it was evidence of a fervent protestation by the people against the practices and faith of the Church. They committed this sacrilege at peril to themselves, for Henry VIII had not then had himself proclaimed "Supreme Head of the Church of England"; indeed throughout his reign he would not tolerate any alteration in church furniture or in the form of service. George Marsh at this time was a boy some seven years of age, and he grew up in this atmosphere of zeal for the reformed faith. Since that time the spiritual tradition of Deane has been maintained by its clergy. The Rev. Charles Simeon, founder of the Simeon Trustees, was a leader of the Evangelical Party, and the clergy appointed by the Trust have been of a similar outlook. In addition to Rev. F.H.Thicknesse three Deane curates became Bishops -Montague Villiers, curate under Rev. E.Girdlestone, was a nephew of Lord Clarendon and married a daughter of William Hulton, Esq. He became Bishop of Carlisle. A.Townley Parker, also curate to Edward Girdlestone, became Suffragan Bishop of Burnley. W.K.Macrorie, after being curate at Deane under F.H.Thicknesse, became Vicar of Wingates, and later Bishop of Maritzburg, South Africa. The following is a list of new parishes formed out of the ancient parish of Deane, with the year of consecration, as given in the Manchester Diocesan Directory. The earliest were chapels-of-ease until the last century. There is in Deane Parish -at Four Lane Ends, Over Hulton- St.Andrew's Mission Church. It is a day school and Sunday school. A part of the building, separated from the main portion by a moveable screen, serves as a chancel with Holy Table, pulpit, reading desk, choir stalls and organ. The Holy Table and Communion Rails came from the parent church in 1889. From the time of its opening in 1887 services have been conducted there, mainly by the assistant clergy, who for many years have been admirably assisted by lay readers. Land was given in 1936 by Sir W.Hulton, Bart., as a site for a new church to meet the needs of an increasing population. The building fund now stands at some £3,000. When Henry VIII seized the possessions of Whalley Abbey, including the living of the chapel of Saynte Mariden, he farmed out the glebe and tithes of Deane to one John Penne, a groom of the King's Chamber. In 1562 Queen Elizabeth leased the tithes to Sir Gilbert Gerrard, Attorney General, whose family seat was Ince Hall. After his death she granted them to James Anderton, of Lostock, for the term of three lives. In addition to certain payments and duties the lessee was required to pay from the tithes a sum of £12 yearly to the Vicar of Deane- the stipend having previously been only £4. In 1610, James I granted the tithes and glebe to Francis Morrill and Francis Philips, of London, one of the charges being o10 for the augmentation of the vicar's stipend. The following year they were bought by James Anderton, who was required to fulfil the same conditions. For a period during the Civil War the tithes were paid annually to "Mr.John Tildesley, a painful preaching Minister, then incumbent," the rectorial tithes having been sequestered from "a delinquent Mr.Anderton of Lostock." The tithes were valued at £154 3s. 8d., but Mr.Tilsley had to make disbursements to "Receiver of the State £40, Mr.Horrocks, Minister of West Houghton Chapel £40, Minister of Horwich Chapel £20"; and to meet certain other charges. Christopher Anderton appealed against the sequestration of his lands and tithes in 1650, but died before the appeal was decided. They were restored to his son Francis in the following year. In 1720 his lands and tithes were sold by Sir Robert Anderton to London dealers, and they were again sold in 1723. In 1777 the tithes appear to have been held by two ladies -Miss Margaret Kenyon and Miss Isabell Edge- for there is recorded a dispute between them and the vicar, Robert Latham, concerning the ownership of trees growing in the churchyard. The matter was referred to Lloyd Kenyon, K.C., of Peel Hall, who became Chief Justice of the Court of the King's Bench and was created first Lord Kenyon. Again it is in a matter of the churchyard trees that we next learn of a further change in lay rectors, for in 1790 a meeting of parishioners asked Henry Blundell, Esqr., of Ince Blundell, to refrain from cutting down and selling the trees in the churchyard. Henry Blundell died in 1810 and left his estates in Lostock, Heaton, Horwich, Rumworth, Anderton and Adlington to his daughters, Elizabeth, wife of Stephen Tempest, and Catherine, wife of Thomas Stones. Stephen Tempest died in 1824. Charles Robert Tempest succeeded to the estates and was created a baronet in 1841. Sir Charles died unmarried, and the Heaton and Rumworth estates passed to his nephew, Charles Henry Tempest, who was made Baronet of Heaton in 1866. He died in 1894, leaving his estates to his only child, Ethel Mary, wife of Lord Beaumont. In 1937, on the death of Lady Beaumont, their eldest daughter, Mona Josephine, succeeded to the estates. References to the Tempest as lay rectors are found in the minutes of churchwardens' meetings. At a meeting of churchwardens in 1822 it was resolved "That Stephen Tempest Esq. be written to by the vicar respecting the state of the chancel," for it was his duty as lay rector to maintain the fabric of the chancel. And in 1886, in reply to a request from the wardens and clergy, a letter received from Mr.Lewis, agent to Sir C.Tempest, stated "that he has no objection to the proposed Organ Chamber." It was thought probable that further information on the history of "Saynte Mariden" could be gained from an examination of the records at Lichfield Registry Office. It is revealed, however, that there is little to add to what is already known, and we are assured that the compilers of the Victoria County History made very exhaustive research in the archives there. 1. The presentation of Deane vicars from Richard Hardie (1636) to Edward Girdlestone (1830), with the exception of John Tilsley (1643) -who, it will be remembered, was appointed by an Order of the House of Commons- and John Angier (1663). 2. The appointment of a number of curates. It was interesting to note Montague Villier's certificate of baptism at St.Margaret's, Westminster, by the Bishop of Bath and Wells. 3. A Humble Petition for the building of a Chapel-of-Ease at Little Hulton, signed by Joseph Yates, James Rothwell, Vicar of Dean, and Geo. Kenyon, Junr. The petition gives the dimensions of the chapel which it was proposed to build on land bequeathed by Catherine Mort in her will dated 1 Nov., 1734, which also included £400 towards the erection of the building. The application was for the ease and convenience of the inhabitants, especially in winter, for they lived three miles distant from the parish church. 4. A testimonial dated 8th Sept., 1760, re Thomas Whitehead, clerk, signed by E.Whitehead, Vicar of Bolton, Ja.Rothwell, Vicar of Deane, and Richd. Rothwell,A.M., and letters concerning the appointment of the above Reverend Thomas Whitehead as curate of Saint Pauls Chappel in Little Hulton within the Parish of Dean. 5. A testimonial in favour of Robert Latham, addressed to William, Lord Bishop of Chester, on being collated to a King's Preachership; signed by Cuthbt. Gaskarth, Curate of Peel, and Samuel Johnson, Curate of Horwich: dated 1791. 6. Documents signed by Wm. Hulton and Rev. Rob. Latham with plan relating to the conveyance of additional burying ground, dated 1813 -as described earlier. 7. An application for a faculty for the erection of an Organ in the West Gallery of the church dated Nov. 8th, 1826, and signed by the curate, Thomas Airey (in the absence of Revd. Thos. Brocklebank), eight churchwardens and Wm. Hulton, Peter Ainsworth, Thos. Ridgway, David Hewitt, M.A., and Richard Ainsworth. Evidently the organ had been erected without a faculty, and it would appear that the bishop, learning of this when he preached the sermon on the occasion of the opening of the organ on September 10th, instructed that an application be made. 8. Plans for the Proposed New Galleries at Dean Church -undated and unsigned. These have already been referred to. The drawings show that several of the steps to the northern portion of the west gallery were built outside the church and led through a doorway in the outer corner of the west wall of the north aisle. It would seem that these steps still remained when the vestry was added in 1822 and it was evidently by their removal in 1896 that the clergy vestry was enlarged. 9. Ground Plan for a New Church at Kearsley -unnamed and undated. Bishop's Transcripts of Deane Registers for the years 1604, 1613, 1614, 1615, 1617, 1619, 1621, 1624, 1626, 1627, 1628 and 1629 were also kept at Chester. All except the one for 1604 have recently been deposited in the Lancashire Record Office at Preston. The recording of baptisms, marriages and burials were ordered by Henry VIII. The earliest original Deane Parish Register is dated 1637. An earlier register which has been lost began not later than 1598, for it was referred to during a lawsuit in that year. Entries in the registers were made in Latin until the year 1735. The perusal of old parish registers is interesting. There is the continuity of surnames from the earliest register until the present day. Parsons sometimes, to explain an unusually large number of burials, would make such an entry as the one by James Rothwell under the date September, 1727- "These dyed of a fever. But in some respects ye disorder resembled ye Plague, and continues amongst us above two years- J.R. vic." A record of baptism reads "October 8th, 1665 -John O'God's Sending." The child was found on the vicarage doorstep one morning; it was taken in and adopted by the Vicar, Rev. John Angier. Again, outstanding events of local interest were noted such as one by Robert Latham in which he comments on the entry in the burials register of "Wm. son of Wm. Horrocks of Rumworth October 31st, 1796." At the foot of the page he writes -"Wm. son of Wm. Horrocks was robed and murdered by Saml. Longworth in Dean Church Lane as he was returning from Bolton about 8 o'clock at night October 27th, 1796. Longworth was executed at Lancaster in the beginning of April following. Gibited on Dean Moor and hung about 8 weeks." In 1667 The Law for Burying in Woollens was passed. This was intended to help a declining woollen trade due to an increasing linen industry. Bodies could be buried in linen or other material on payment of a fine. The Act was not repealed until 1814. To indicate that the law had been complied with many registers have the entry "Affidavit received." There are no such entries in the Deane registers but evidently fines were collected when the law was not observed, and record made in the books of the townships as the following entry shows -"December 26th, 1683. We whose names are subscribed do agree that Symon Haydock (Parish Constable) do pay the 4s. 9d. in his hands unto Robte Ward and we desire that Martin Taylor, churchwarden would also pay 7s. 11d. towards satisfying 3 Hultons and Rumworth for Mr. Harpur's burying in Linen...."
We see from the records how churchwardens had certain civil as well as ecclesiastical responsibilities and how that they themselves -at least the wardens at Deane- were not above public censure and control, for a meeting of parishioners on April 16th, 1734, resolved "That ye churchwardens at ye expiration of their office shall be allowed according to custom eight shillings and no more.... That ye churchwardens for the future shall not allow any workman drink at ye parish expence, nor be allowed themselves any drink...."
Our old registers, churchwardens' accounts, faculties and other documents were deposited in the County Record Office in 1949 for safe keeping. It has been mentioned previously that amongst the Hulton documents deposited at the County Record Office are some relating to the church and several of these have been quoted, but the most valuable relic amongst them is the original Letters Patent creating the Parish of Deane. The document is in Latin manuscript and is wonderfully well preserved including the gold of the initial letter. The Great Seal of England is affixed by silk cords of green and white, the Tudor colours. Deane Church does not claim imposing architectural features or embellishment. It is a plain, homely village church, yet it possesses dignity and charm which appeal to all whose privilege it is to worship there. "Deane Sermons" is an event which yearly brings many hundreds of people from far and near to attend the services and renew old friendships. It is hoped that this brochure will provide a more intimate understanding of the church and its story to our own people and to our visitors that they may have for the old church a greater affection still. The parishioners are mindful of maintaining in a state of good repairso great a heritage. Under expert advice and supervision a scheme of improvement and repair is now in progress to the end that they of this generation may pass on unimpaired the treasure entrusted to them. "The Victoria County History of Lancashire." "Armorial Families," by A.C. Fox-Davies, and other books on Heraldry. "Records and Traditions of Deane Church, Village and Parish," by James Boardman. "History of Deane, Bolton-le-Moors," by J.J.T. Hill. Canon C.E. Jarman, Librarian of Chester Cathedral and the Registrars of the Diocese of Chester. Harold Hamer, Esq., Chief Librarian, and his staff at the Bolton Reference Library. R. Sharpe France, Esq., County Archivist, of the Lancashire Record Office. We wish also to express our appreciation of the help given by the Rev. K.M.Bishop and by Robert Walmsley, Esq., who for many years has made a study of local history an been a generous donor to our church library.